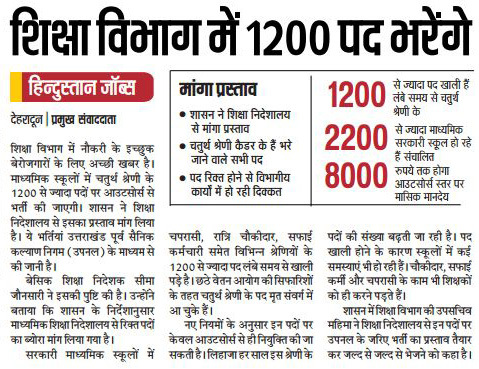 Education department is going to filled 1200 post very soon. This is a good news for all unemployed candidates that they will again get a chance of govt job in education department. After LT & Guest Teachers recruitment, education department is going to recruit on 1200 post for 4th class employee. After the retirement there are many post vacant in education department and due to lack of workers department is also facing problems. Directorate of education department has asked for the details of total vacant seats from the department of secondary education. As soon as they will get all the details about vacant seats, they will do recruitment on all vacant seats. All 1200 post are for 4th class cadre and employee will get Rs 8000 stipend per month. Help us to improve this article/job posting "1200 post will be filled soon in Education Department". We would be glad if you can comment below and provide your valuable suggestions and feedback. If this page have any wrong information/list or out of context content, then you can report us as well. Please notify me as and this published.